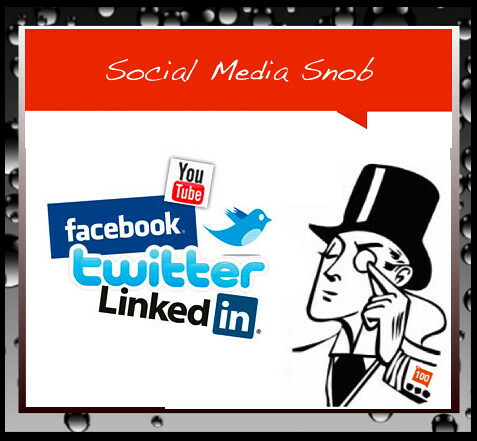 Has #Klout & Measuring Influence Created A Wave Of #SocialMedia Snobs? Social Media as we know it now is relatively new with all of the exposure, engaging and sharing of content from a variety of avenues. Of course there were other online platforms available back in the day but we all know that they have not had the impact that present day social media channels have. I just wanted to put that out there so all of the people that CLAIM to have Ten Years Social Media experience won’t write me spouting off about how they were on forums, AOL blah…blah …BLAAAHHHHH because this blog post is NOT about that. One of the things that I’ve notice lately is the growing number of people that are a little snobby about social media and the creation of a social media cast system so to speak based on the measurement of influence or lack there of. There are people that may thrive in some areas of social media a bit more than others, but how can there really be a mastery to the extent that one feels superior to those that may not know as much? Especially when social media is still growing and evolving and we are ALL learning daily about the various channels and platforms. As soon as it is perceived that we have mastered one area it changes and we have to start at square one almost. This is the primary reason NOT to feel superior about any step you may have ahead of a person in any one platform. Klout and other channels used to make an attempt at measuring social media influence are really responsible for creating a wave of social media snobs that feel superior, if these so called influence channels give them a score that is higher than other people. Klout is really not a valid measurement of social media influence or anything beyond a channel that is now geared toward sales and increasing their own worth. I am not knocking this as this has shown to be a lucrative business platform to most because after all increasing revenue is the reason why most companies are in business. I say this, however to make people think about basing their perception of themselves as higher and others lower based on a system that has flaws in the measurement of influence. This measurement of influence is based on an algorithm that we are unfamiliar with, that can change on another persons whim and by a company that is driven by increasing their own revenue. Again, I am not by any stretch minimizing any business platform based on increasing revenue only cautioning that WE should not base our opinions on others based on reasoning of a company driven by profit. Further we should not minimize interaction and or engagement based on social media snobbery created by some perception of influence. Social Media is a conversation and geared toward increasing interaction between people and or companies. Social Media should not be used to create a hierarchy, minimize others and practice snobbery so much so that we feel others are unworthy of conversation, based on any flawed platform of influence. Well, Klout is fun as long as your score is easy to understand ( which is not when they change up suddenly) and if the score doesn’t crash for no reason ( which it does). The issue that I have started to notice is that people decide WHO they want to talk to or not to based on their Klout score. It’s almost as if they person is unworthy of a conversation by way of social media if they have a lower score. Anise, YOU make it about forums and AOL. I don’t think anyone cares, or will go out of their way to point that out, and it seems entirely unrelated to the rest of your post??? People who are really influential in Social Media though, they aren’t affected one bit by their Klout score. They sell books, make a six figure income from speaking, and don’t have to be validated by Klout because they are too busy presenting at Blog World. Our Empire Avenue friends are pre-occupied with latent social proof sometimes, it’s best to just ignore it and not get too riled up over it. There are things you can learn that don’t get reset every time a platform changes though. Mark Shaefer wrote a wonderful piece yesterday that listed HR professionals, Journalists, and Statisticians as the 3 major fields that will be in demand in large part due to new media. With that being said, I have to agree with you that Klout is a flawed index (and gamed easily, as is demonstrated by our friends on EA). It isn’t a good network or content aggregation tool, and Klout has NEVER billed themselves as such. It’s a tool that has a powerful API that can be integrated into other tools to allow you to quickly judge a user’s Social Media involvement and relative influence. It is a terrible tool if you’re trying to find a single influencer, but it’s probably a great tool if you want to find a list of 200. Being a basis for who you interact with? That is probably more than conceit, but more of a personal mental disorder related to delusion and grandjeur, and definitely a misconception of what social media is for. I agree with what you’re saying, but it’s the majority opinion, even though it doesn’t seem that way sometimes. Most people will never use Klout or social media like that, and anyone who advises that type of behavior has always been considered an idiot, no one makes fun of the retarded kid though – it’s not polite. Hi Jeremy! Thanks for taking time to read, comment and leave me a copy of your great post! LOVED IT and shared it!